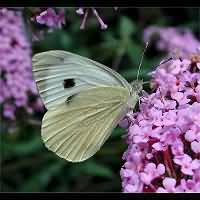 The Large White looks like the Small White very much. 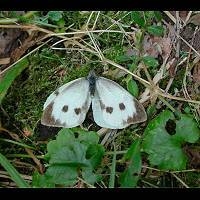 However the black spot in the tip of the wing usually is larger and darker. And it is a larger animal of course. 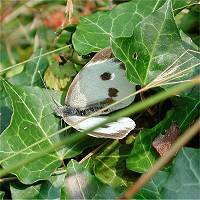 The Small White is about as big as a Small Tortoiseshell. 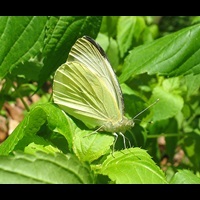 The Large White, having a wingspan of up to 65 mm often is the size of the Admiral or the Peacock, or even a bit larger. 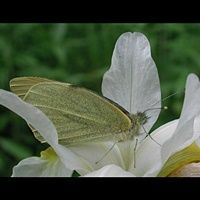 It frequently even looks larger than that, for it rarely slides the for and hindwing above oneanother, habitual for both the Mustard White and the Small White. 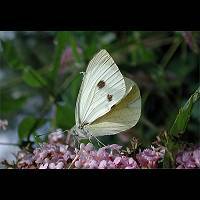 The species can be found in Europe and Northern Asia, but has not been introduced in Northern America and Australia. It was introduced in Chili though turning into a common species. The males differ from the females by being less marked. First generation males have a dark wingtip and two greyish spots. In the second generation these spots are much darker. Females of the first generation also have two spots, but these are very black and clearly visible. In the second generation females the two spots are much larger, often merging into one large black smear. 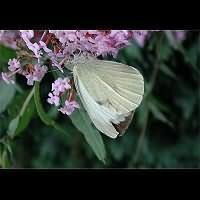 The Large White is the most damaging among the whites in agriculture. The eggs are deposited in groups, hatch quickly and the caterpillars do have an enormous appetite. Poison is still used frequently to fight the species in agriculture, but the use of certain parasitic wasps also proved successful. The species is very hard to fight though, for in nature the caterpillars will also eat thistles and other big plants. The caterpillars are different from most Whites larvae: they have rather long hairs, are black with dots and yellow lines. 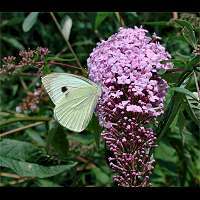 They can afford to be rather striking, for they contain a poisonous and badly tasting component extracted from the cabbage plants. This make them poisonous to small birds and foul tasting to bigger ones. 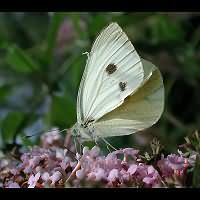 The Large White usually has two broods a year, but sometimes a third generation may appear. The pupae of the second generation overwinter. 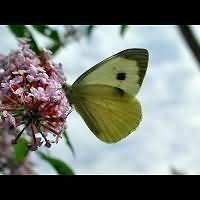 Butterflies are not flying about elegantly, most are just flapping about. But even when the wings are heavily damaged, they manage to fly about in their curious way. The animal in some of the pictures is good proof of that. This page has last been modified on Friday, January 25, 2019.